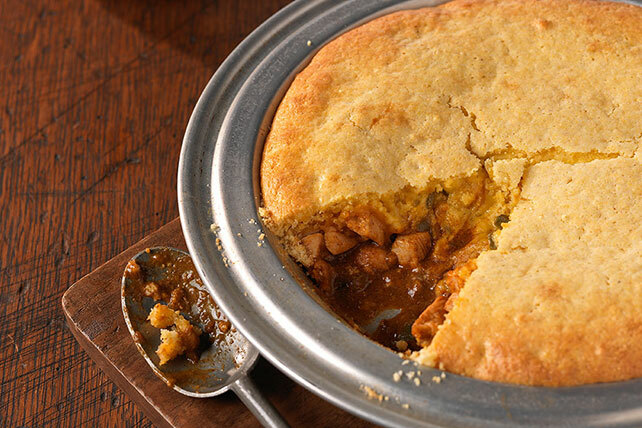 Get creative with your cooking when you make this Chicken-Taco Cornbread Pie. Tacos take cover under golden cornbread to create this warm, comforting Chicken-Taco Cornbread Pie that is packed with delicious flavor. Heat oil in large skillet on medium-high heat. Add chicken; cook and stir 5 min. or until done. Stir in peppers, seasoning mix and water. Bring to boil; simmer on medium-low heat 10 min., stirring occasionally. Spoon into 9-inch pie plate sprayed with cooking spray; sprinkle with cheese. Prepare muffin mix as directed on package; spoon over cheese, completely covering cheese layer.